The Ducorps' Cockatoo (Cacatua ducorpsii) is endemic to the Solomon Islands where it is common across most of the Solomons, absent only from Makira in the south. It inhabits lowland rainforests, secondary forests, cleared areas and gardens. The Ducorp's Cockatoo is larger than the Goffin's Cockatoo but smaller than the Umbrella Cockatoo. Notable features of this cockatoo include a blue eye ring and a recumbent crest which resembles a sail in its raised state. 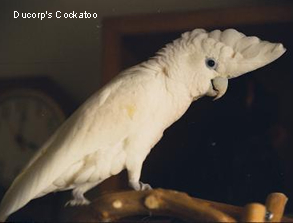 The Ducorp's Cockatoo is reported to be intelligent and playful. They are quieter than most Cockatoos and make sweet pets given a right environment that takes into account their need for plenty of companionship / interaction and mental stimulation. Even though they are smaller than most other cockatoos (not as small as the Goffin's Cockatoo though), they are very active and need roomy cages and lots of toys. Ducorp's Cockatoos grow to about 13 inches in length. Notable features of this cockatoo include a blue eye ring and a recumbent crest which resembles a sail in its raised state. They have predominantly white plumage although sometimes the hidden bases of the head and breast feathers have a carnation pink base. Their crests are round and very broad. Ducorp's Cockatoos have pale yellow undersides to their wings and tails. Their feet are gray and their bills are grayish-white. Males have dark brown or black irises, while females have more red coloration in their irises. Ducorp's Cockatoos are quite rare in aviculture. Breeding pairs need an aviary of at least 12 x 6 x 6 feet in dimension.